SIDLAB Acquisition is used to acquire the measurement data needed to characterize the passive acoustic properties (e.g. Transmission Loss) of two-port elements (e.g. exhaust or intake mufflers). SIDLAB Acquisition is provided together with a Data Acquisition System and the measurement microphones. It automates the measurement procedures accounting for different theoretical and practical considerations. Different excitations (random or stepped sine) can be used. The results are stored in different formats compatible to SIDLAB Acoustics and can be used to simulate a complete system. SIDLAB Acquisition is very useful for companies and research institutes, who perform this measurement as a standard measurement which is repeated frequently throughout the design process. 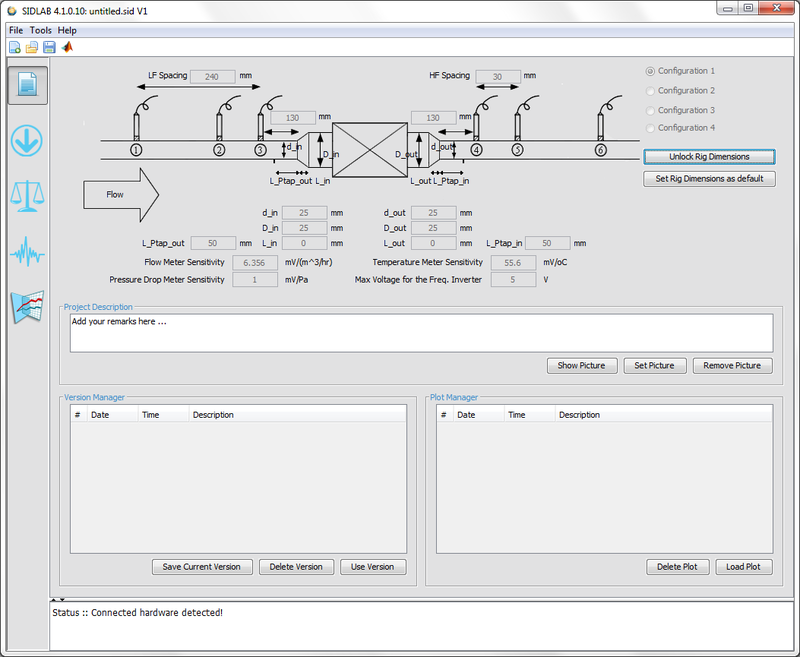 SIDLAB Acquisition uses the two-source location technique which has been proven to be the most stable and most efficient technique to measure transmission loss. Perform the absolute and/or relative calibration. Conduct the upstream and downstream measurements. Calculate the transmission loss and the transfer matrix for the measured object. Optional add-on: Measure the pressure drop across the muffler at different flow speeds and calculate the muffler loss coefficients. Optional add-on: Measure the flow generated noise inside the muffler (radiated sound power). It is very common to perform this test with flow through the pipe. SIDLAB Acquisition has an optional add-on to control the fan speed (providing the flow) through the same interface. Flow speed and temperature are also measured automatically and used in the calculation. Figure 1 SIDLAB Acquisition Interface for the Input Data. It supports stepped sine capabilities which provide better results, especially with flow. High Signal to Noise Ratio, easier to extract the loudspeaker signal from the flow noise. It is easier to use and faster to do repeated measurements. It has all functionalities integrated in one place. Transmission Loss in downstream (exhaust) and upstream (intake) directions. Components of the Transfer and Scattering Matrices. Acoustic Pressure at all the microphones and the coherence to the reference signal. Background Noise and Flow Generated Sound Power. Pressure drop – flow curve, and loss coefficient. The software supports a variety of post-processing functions. It also supports the export of the raw data for further post-processing in another software. Different versions of the measurement can be saved in one project file with several functionalities to compare with other versions in other project files.